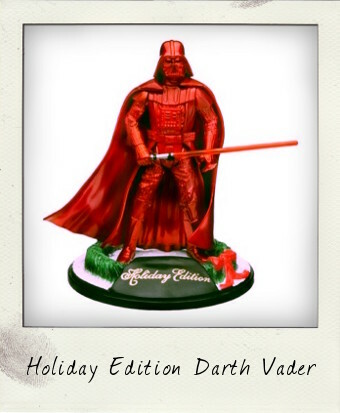 'Tis the season to be jolly, so here's a look back at Hasbro's Holiday Edition Darth Vader action figure that was a StarWarsShop.com exclusive back in 2005. Essentially the same figure with eight points of articulation which had been issued as part of the Original Trilogy Collection in 2004 and earlier still as part of the Toys 'R' Us Star Wars Saga multipacks in 2003, this Darth Vader had one major difference which you may just have spotted – a head-to-toe Santa-style coat of red paint! Thanks to Vader's expert planning, this year's Hoth Holiday Bash is primed to be the best the galaxy has ever known! Packaged with a special holiday garland display stand, cape and lightsaber, this edition even included a Christmas card picturing Darth Vader building a Stormtrooper – or rather “Snowtrooper” - snowman! Great fun and a must-have Star Wars collectible!